A key partner of the USAID Sapan Program in Thailand was presented the 2016 Secretary of State’s International Women of Courage Award. 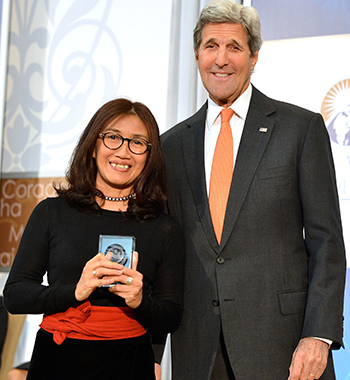 Rodjaraeg Wattanapanit, 50, co-owner of a bookstore, Book Re:public, was one of 14 recipients lauded at a March 29 ceremony in Washington, D.C., led by U.S. Secretary of State John Kerry. The activist from Chiang Mai in northern Thailand was a close friend and grantee of the Sapan program; Cafe Democracy, which is hosted in her bookstore, was one of Sapan’s flagship beneficiaries. Implemented by DAI, the USAID Sapan Program operated from 2010 to 2015 promoting cooperation between civil society and government, strengthening the role of community organizations, facilitating constructive public dialogue, and promoting citizen engagement. Sapan convened leaders, academics, and managers from all sides to design and guide activities and pursue ways to keep these groups in sustained creative interaction. When it opened in October 2011, Book Re:public became well-known among citizens, students, and other youth for its interesting and innovative events, and for the renowned speakers it hosted. For its initial course on democracy, 500 people applied for the 20 spaces available. The course has since been instrumental in educating participants about aspects of democracy and other forms of governance, and for encouraging youth to become more engaged in local governance. Reaction in Thailand and from Wattanapanit’s colleagues from the USAID Sapan Program came quickly and enthusiastically. “I was so happy to see a great woman, a friend, and a favorite Sapan partner win this award,” said Marjan Jukić, Sapan’s former regional program manager. “As she told me yesterday, Sapan is a huge part of this as we helped make Cafe Democracy what it is today, investing not just grants but also ideas, knowledge, passion, and support.